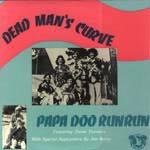 Cupertino's Papa Doo Run Run, along with Dean Torrence, recorded this soundtrack for the television movie Dead Man's Curve, the Jan and Dean story. Dean Torrence is featured, along with Jan Berry on a track or two. Two lone instros reside on this LP. This promo only disc is long out of print. If you escape the nostalgia trip of Papa Doo Run Run, you can enjoy this standard performance of the Chantays' "Pipeline." There's nothing special, but the band does lay it down with a dry reverence. This is a pretty tame rendition of the Surfaris' signature tune. The drums don't hold up to comparison with Ron Wilson's original, but then what version does?